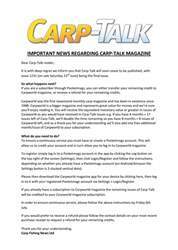 This week’s issue of Carp-Talk (issue 1042) is available to download now. 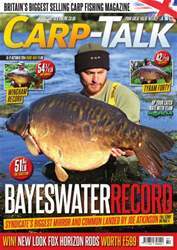 We have got some sensational fish in this issue once again, few better than the Tiger Fish of the Bayeswater syndicate, caught, along with the Coconut Common, by Joe Atkinson. 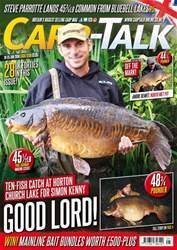 We look ahead to the UK Carp Cup final at Richworth-Linear Fisheries’ Oxlease Lake and review the qualifying rounds of the Midlands Carp Cup. Neil Spooner incorporates the new Krank Choddy hooks in his chod set-up, Dave Springall steps out of his comfort zone, and products from GoPro, Fox, CarpBaitUK and DT Bait Developments go under the spotlight in ‘Trade Talk’. 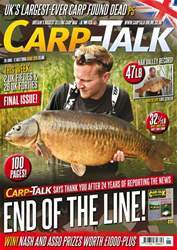 The Fox-Mainline CAOTY competition continues, the Sticky monthly winners are announced, and there is £599 worth of Fox Horizon XT rods to give away.